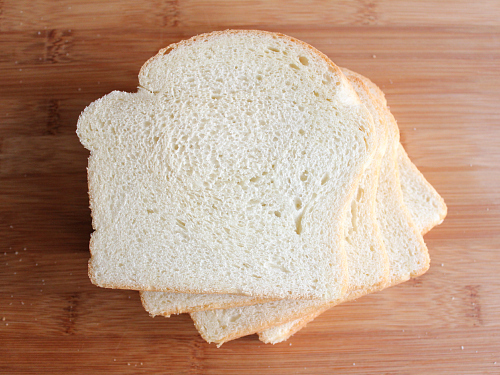 white sandwich bread is a staple in most households. it's perfect for toast, peanut butter and jelly sandwiches, tuna fish sandwiches, ham and cheese sandwiches . . . you get the picture. sure, it's quick and easy to just pick up a loaf of bread at the grocery store, but have you ever read the list of ingredients on the back of the bag? often there's a whole bunch of stuff that you can even pronounce on that label. 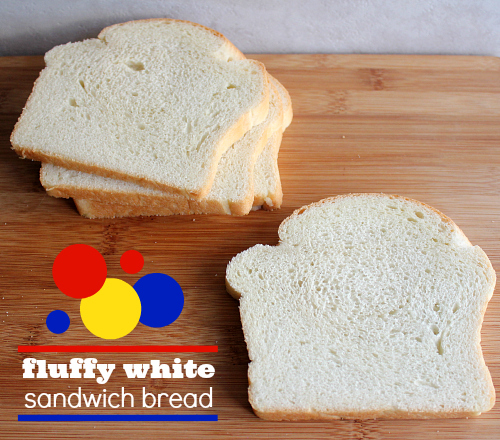 luckily, it's super easy to make your own white sandwich bread at home from just a few simple ingredients that you will have no problem pronouncing. it's important to know what you are putting into your body. homemade bread. is there anything better? you just can't beat the smell of bread baking on a weekend morning. it's heavenly. it fills the whole house with a warm and cuddly feeling. 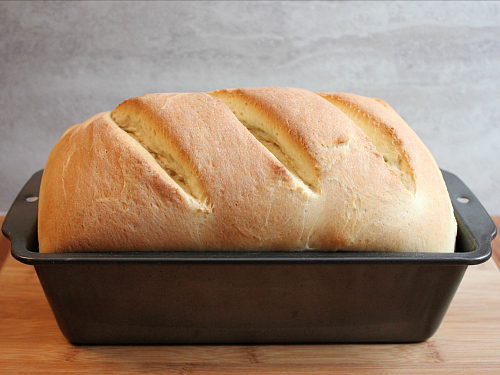 this bread recipe has become a favorite in our house. 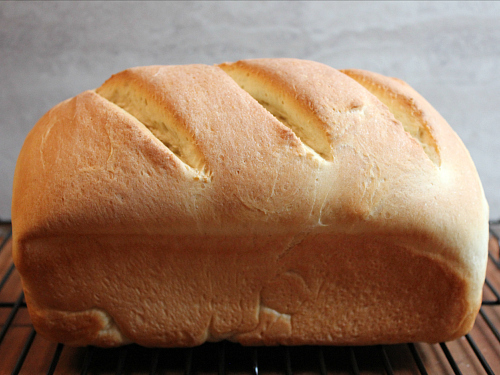 i made a loaf of this bread on saturday morning to use for sandwiches for lunch. 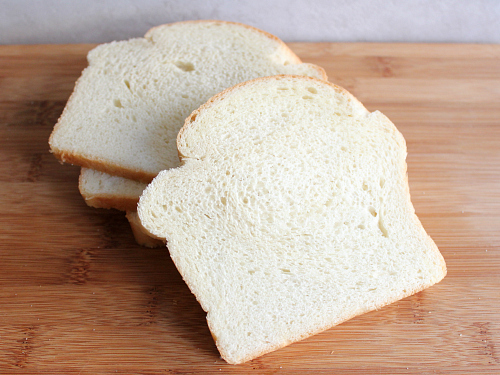 it is the perfect white sandwich bread recipe because it produces a loaf of bread with a crusty crust (crusty crust . . . you know, a technical baking term) and it is super fluffy inside. it's oh so fluffy. just look at that beautiful fluff . 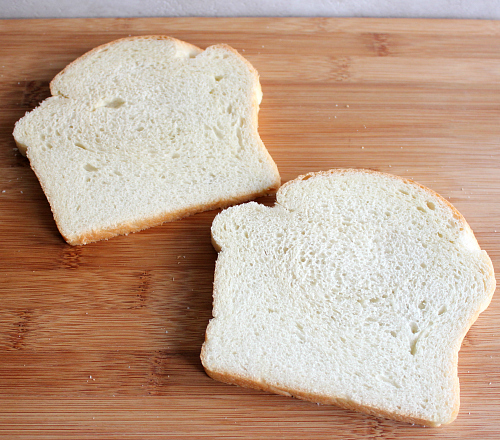 . .
this bread is so easy to make. there are just a few simple ingredients, and you can pronounce them all. from start to finish the whole thing is done in just over 1 hour. talk about quick. so, if your tired of ingredients that you cannot pronounce on your store-bough loaf of white sandwich bread, this is the recipe for you! in the bowl of an electric stand mixer, gently stir together the yeast, sugar, warm water, and oil. let it sit for 5 minutes. in a separate bowl, sift together the flour and salt. add the sifted flour a little at a time, and mix with a dough hook. once the flour is incorporated, knead the dough for 5 minutes in the stand mixer. remove the dough from the mixer and knead the dough by hand for an additional 3-5 minutes on a lightly floured surface. place the dough in a greased bowl, and then cover the bowl with plastic wrap and a kitchen towel. let the dough rise in a warm place for 30 minutes, until doubled. once doubled, punch the dough down and form it into a log. put the dough into a well-greased loaf pan, and let the dough rise for 10 minutes. preheat your oven to 425 degrees F. use a serrated knife to make 3 diagonal slices in the top of the dough. bake at 425 degrees F for 10 minutes, then lower the heat to 350 degrees F and bake for an additional 10 minutes. once the bread is baked, remove it from the oven and allow it to cool before slicing. A good looking loaf of bread. The cut pieces look like fluffy white clouds.